With help from thousands of Vermont neighbors… we made it! 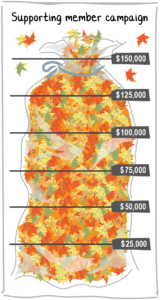 Thank you to those who chipped in to help reach Front Porch Forum‘s October Supporting Member Campaign goal of $150,000. We’re proud to play a part in strengthening connections between neighbors — and we’ve seen how much FPF means to our members. In a recent survey, 85% of FPF members reported being more optimistic about the future of our communities. And that is something to celebrate! So thanks for the participation and support. If you meant to make your contribution and haven’t yet had a chance, there’s still time. Donate today!